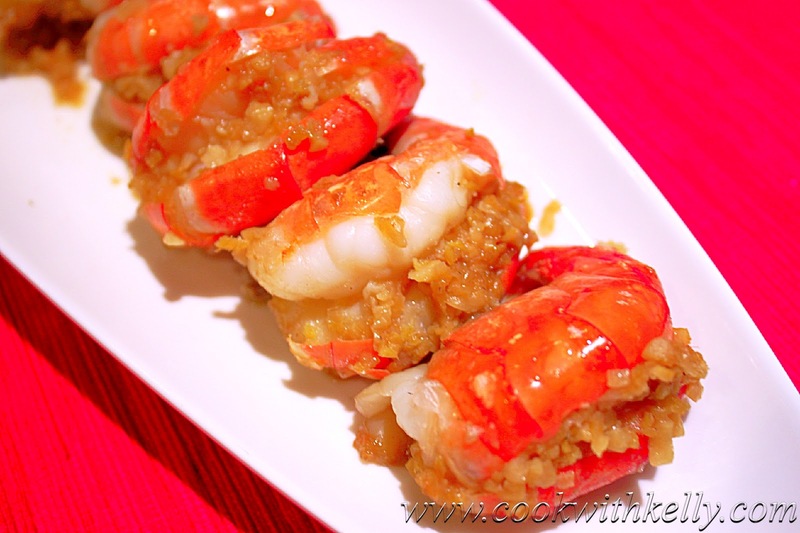 When I made the Steamed Tiger Prawns with Garlic, I also saved half of the prawns to make this dish as well. It's great because most ingredients are the same, just different cooking styles. If you host a dinner or party, you may try this too. Use half of the prawns to steam and the other half to bake, to give your guests more variety to choose. For my two and half year old toddler, she liked this dish more because she loves the taste of butter. When you put garlic and butter together it makes everything tastes better. Compare to the Steamed Tiger Prawn with Garlic, this dish tastes richer but also very delicious. Clean and devein all the prawns. Keep the shell on. Use a knife, cut the prawn from centre of the back. Make sure not to cut it through - this is for the filling. Making the garlic filling: In a small bowl add ground garlic, ginger, sugar, salt, pepper powder, cooking wine and soy sauce. Mix everything evenly. Fill up all the prawns (to the cut on the prawn's back) with the garlic filling, and place them to a plate. In a baking pan, place a piece of foil sheet on top. A`dd half butter and then place all the prawns on top. Add the rest of butter on top of the prawns. Fold the foil sheet and then transfer to the oven. Heat up the oven to 400 degrees Celsius high for about 20 - 25 minutes. Transfer everything to a serving plate, you are done! is it 400 degrees fahrenheit to celsius?